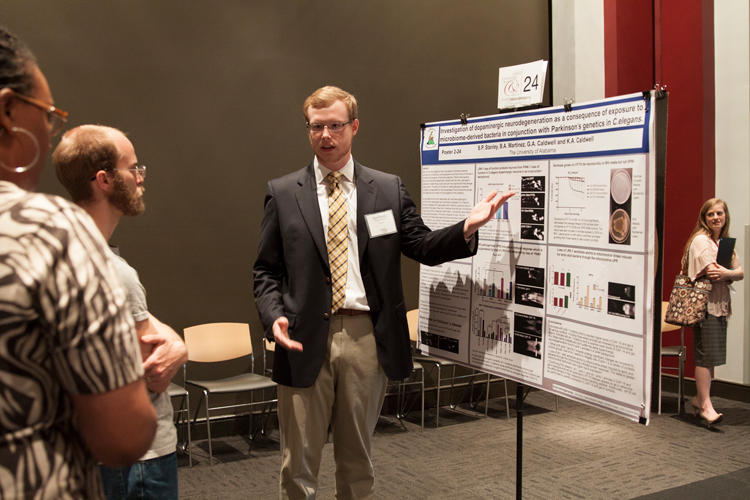 Scholars often use posters to share their work at conferences, symposia, and other events. A good poster will present your ideas in a clear, concise, and visually interesting manner. It will clearly communicate the important points of your research, while also inviting feedback and conversation. Creating a research poster in Powerpoint is a multistep process. These tips will help you produce a high-quality poster for the URSCA Summit and any other event you attend. Your poster will be created on a single slide (ONE). The page size must be your desired print size. You must complete this step before creating the poster. Designing the slide before designating the print size will lead to a low-quality print. To prevent cropping when printing, be sure you have a 1-inch margin around the edges of the poster. To set the slide dimensions, follow the steps outlined in the Change the Size of Your Slides page (Powerpoint 2016). The Office of Undergraduate Research provides a poster template you may use. Your poster should read from top left to bottom right like you are reading a page. It is important to maintain a good contrast between the background color and the text. Consider using a light color background and a dark text. A gradient color fill background, especially black, will print poorly; it will have thin, visible lines that you will not see on your computer monitor. Remember the colors you see on your computer monitor will not reproduce exactly the same on a printed poster, as monitor color settings vary. You can expect a color shift of 2 to 3 shades. Images copied from the web are low resolution (72 dpi) and are not proper quality for a printed poster. Limit image resolution to 150 dpi to ensure printability. All pictures (e.g. tif or gif for transparency, jpg for non-transparent images) should be inserted directly into the Powerpoint, not linked from another program. Jpeg is the preferred image format if you do not need a transparent background. If you have graphs or charts from Excel, simply copy and paste into Powerpoint. Do not enlarge images after they have been inserted into Powerpoint. To adjust an image and retain proper proportion, hold the shift key on your keyboard, click, and drag the corners to scale. It’s best to use a cross-platform font to ensure your poster looks the same in every scenario. If you download an operation system-specific font (i.e., only Mac or Windows), you must embed that font in your PDF. The title should be approximately the entire width of the poster with the main text broken into multiple columns, usually three or four depending on the size of the poster. You may also want to use section headings within the columns. Sans-serif fonts work best for posters, particularly for titles, subtitles, and headers. The most common fonts are Times New Roman and Arial. Other fonts include Arial Black, Franklin Gothic Heavy, Tahoma, Trebuchet, Verdana, Garamond, Book Antiqua, or Bookman Old Style, just to name a few. You may need to adjust the font size depending on the font and the amount of text on your poster. For readability, do not use a font smaller than 18 points. For consistency, make all the headers the same size, and use the same font size throughout the poster for all body text. If your text is in a different file (e.g., in a Word document), be sure it pastes into a text box in PowerPoint so it can be edited. University Printing requires a PDF file set to your custom page size for proper printing. To save a Powerpoint to PDF, follow the steps outlined in Saving PowerPoints Presentations as PDF Files.